Not that long ago, knowing who your business was interacting with was straightforward. You interacted with them directly. You shared a meeting room, shook their hand, or spoke with them over the phone. But as the world becomes increasingly digital, tracking various users (customers and partners like vendors and consultants) is far less cut-and-dried. Today, teams must find ways to understand who is accessing their systems and working with their data and, even more importantly, whether or not they’re actually supposed to be there. Put simply, companies must develop their own identity infrastructure. What Exactly Is Identity Infrastructure? To create the right identity infrastructure for your team, it’s important to define what identity management means in the context of your business. At Auth0, we define identity management as the cornerstone that glues internal teams and apps together in a single framework. As organizations become larger and more distributed, and information is dispersed in more and more complex formats, companies often rush to implement systems and apps in an effort to be more connected and efficient. What most companies lack, however, is an underlying identity infrastructure. Identity infrastructure allows an organization to scale in a more secure and sustainable way. It is the combination of technologies and processes that helps you manage the digital identities of every one of your users at any point in time. The best identity infrastructure is extensible and will evolve alongside your team. The importance of having a solid identity infrastructure in place can’t be denied. Unfortunately, both small businesses and larger enterprises often treat it as an afterthought. “Organizations are flocking to cloud services and mobile devices to cut costs and boost productivity,” writes George Moraetes, in an article for SecurityIntelligence by IBM. “Despite the benefits, these technologies exacerbate the challenge of verifying identities and managing access to applications and data by consumers, employees and business partners from multiple devices and locations,” he adds. Many businesses jump on cloud solutions and advancements without giving necessary thought to their identity infrastructure. This means they rely on legacy systems and antiquated processes for identity management, which can lead to headaches and security messes down the line. Older technologies can bring unnecessary redundancies — and companies miss out on opportunities to become more efficient and innovative. The good news is that there are concrete steps that teams can take to either establish or improve their own identity infrastructure — both with their business partners and customers. What's better, you don't need separate systems for each category of users. The same identity infrastructure can underlie both. 1. MONITOR AND MANAGE ALL USERS WITH ONE CENTRAL VIEW. Despite growing concerns about security, far too many companies don’t actually have clear insight into how users are behaving within their system. 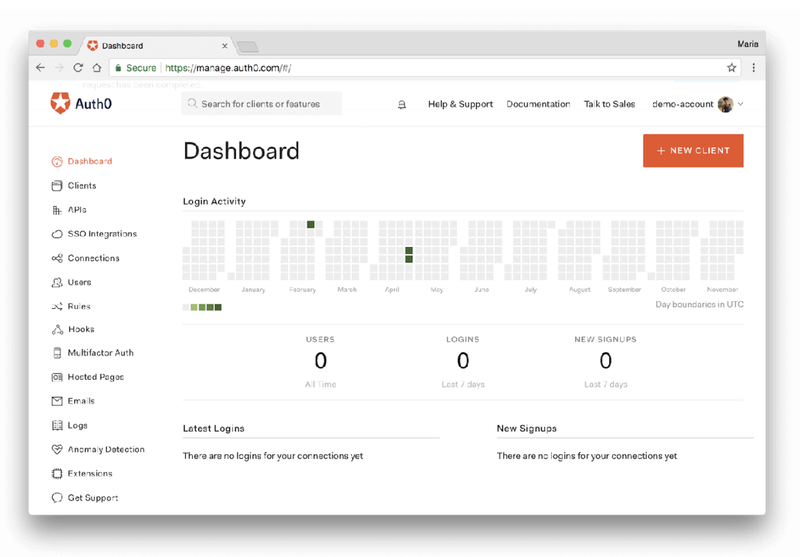 With a solution like Auth0’s Dashboard, you can observe all activity, broken down by individual user, at any point in time. A dashboard can improve the entire login experience for your users. A reported 25% of users forget their passwords daily and often need to use the system reset. According to Gartner, between 20% and 50% of help desk calls are for password resets, and Forrester Research estimates that the average cost of a single password reset done by a help desk is a whopping $70. Needless to say, having a straightforward place to manage both your application and your users that goes above and beyond passwords will save you and your team hassles, time, and, as a result, money. 2. CONSIDER OUTSOURCING YOUR IDENTITY NEEDS. Engineering teams balance hundreds of tasks every day to simply keep their systems up and running. If you're in the middle of a new product rollout, you need all hands on deck to be sure you deliver something of value for your customers on time. In these situations, outdated identity infrastructure shouldn't weigh you down. Outsourcing your identity needs can give you peace of mind — knowing that you're working with the latest software out there and a team that's dedicated to this 24/7 (not juggling identity management with building and shipping new products, sourcing and investing in new tools, and managing junior developers). Identity is a complex and quickly evolving discipline. An expert team like Auth0 can simplify it for you and give your team more time back to focus on tasks that are clearly tied to your bottom line. 3. STAY UP TO DATE WITH NEW SECURITY REGULATIONS. Experience and ease of use are undeniably important considerations in identity infrastructure. But it’s not all about the bells and whistles. When you’re dealing with user identities, there are ever-evolving security concerns and regulations that you need to keep up with—from GDPR requirements to state regulations like the California Consumer Privacy Act and even industry standards like HIPAA. That adds an extra layer of complexity to your identity infrastructure, which again speaks to the importance of finding a platform or solution that prioritizes security and compliance for you. Auth0 supports industry-wide authentication standards and ensures compliance with the growing requirements of numerous leading organizations. As the world becomes more connected and security concerns mount, businesses can no longer afford for identity infrastructure to be an afterthought. But as a leader in your organization, you want to focus on increasing returns, not on establishing these processes and cleaning up security messes. Building better identity infrastructure — or partnering with an expert third-party provider — will give you a stronger foundation for long-term growth. Fortunately, outsourcing the creation of your identity infrastructure gives you peace of mind while also freeing up your time to tackle projects that directly impact your bottom line.